SAUFEST is a noble concept of the AIU that ensued with a goal to promote active collaboration and mutual understanding among the South Asian Countries in educational, social, cultural and economic fields thus bringing the youths to share their views and ideas on a common platform. From Bangladesh we from BRAC University along with our team of 12 members that included our two teachers Sahana Bajpei Chowdhuri and Tanzir Ahmed Chowdhuri and a team of 10 students from different departments started our journey for the beautiful city of Kathmandu Nepal. On our way to the Airport, we met the Team of National University who will be representing Bangladesh with us. The team included BUET, DMC, Rajshahi University, Chittagong University, Independent University and a few colleges under NU. At the airport the Kathmandu University Heartily welcomed us with flowers and ushered us to their beautiful university located on the peak of a mountain in Dhulikhel. After reaching and getting done with the registrations, we stood stunned by the view of the Himalayas that seemed only a few miles away, changing colours every few minutes! In the morning we all dressed up for the procession and banner displays in the opening ceremony of SAUFEST 2008. Following request of our teachers, we wore Sari and Panjabi and then hoisted our University flag and the Bangladesh Flag in the chilli breeze yet wonderfully sunny weather and walked on with the other universities to the centre of the huge field of KU. Speaker of the Legislature Parliament, Mr. Subash Chandra Nembang inaugurated SAUFEST 2008 on Thursday in Kathmandu University to mark the official beginning of the five-day long mega event. 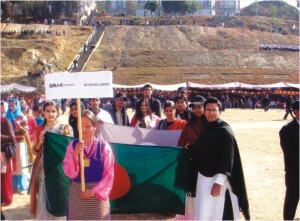 Speaking in the program, Mr. Nembang emphasized on the importance of interaction among the youths in South Asian region. Addressing the event, Vice Chancellor of Kathmandu University, Prof. Suresh Raj Sharma, expressed his happiness. The event was also addressed by General Secretary of Association of Indian Universities (AIU) Prof. Dayanand Dongaonkar, SAUFEST Chief Coordinator Mr. Sampson David, and Vice Chancellor of BITS Prof. L. K. Maheshweri. As a gesture of friendship and collaboration, a simultaneous flag hoisting event was organised by the Vice Chancellor of KU, Prof. Suresh Raj Sharma, Chief Coordinator of SAUFEST, Mr. Sampson David, and AIU General Secretary, Prof. Dayanand Dongaonkar who hoisted the flags of KU, SAUFEST and AIU respectively. Prof. Sanjay Nath Khanal, Secretary of the organizing committee of SAUFEST 2008, welcomed all the dignitaries and participants. The program concluded with a Vote of Thanks by Registrar of KU, Prof. Bhadra Man Tuladhar. In the program, students of Kathmandu University High School sang the National Anthem and Nepal Army displayed their colorful band. 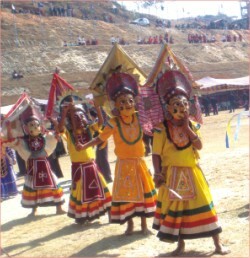 Other attractions of the program were ethnic dance, musical performances and cultural processions by various groups of Panauti, Panchkhal, Dhulikhel and Banepa. The cultural exchanges attained a vibrant colour on the second day as the participants from all the Universities rendered majestic diversity in their performances in the CV Raman Auditorium KU. 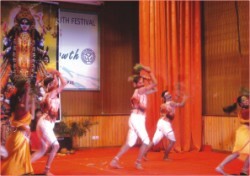 The students from Rashtriya Sanskrit Vidiyapeetha, Tirupati, India showed their exclusive performances of Kali dance that featured the Human pyramid. Then came the Spellbinding performance of Banasthali University, India, with their tribal dance with fire in the pots on their head. The dance was fast paced and facial expression was well matched with their steps. In the climax they stood on plates by its borders on steel glass while their smiles showed that they would not loose balance no matter what. It was a marvel to watch a simple poetry in motion or in this case a rhythmic drama. Then came Shabnam Mustafa from BRAC University who alone lit the stage on fire with her mind-blowing dance with Ghate lagaiya dinga paan khabar jao. There were ghazals from Punjab University and equally enticing light vocals from the Visvesvaraya Technological University, Jadhavpur University of India and BRAC University and Independent University of Bangladesh. Among the other noteworthy performances were the modern and folk dances from National University of Bangladesh, Banepa Municipality, Tribhuvan University and Kathmandu University, which instilled the cultural richness in our minds. After the mind-blowing performances at the CV Raman Auditorium, we all headed for the warm reception awaiting us at Dhulikhel Municipality. Their smiles, marigold flowers and khadi shawls ushered us towards the streets of Dhulikhel, where the local musicians, elderly people from the senior citizen service centre and school children stood clapping to greet us. They guided us through the cobbled streets of Dhulikhel, from its modern parts to its historic areas and finally to its office. On our way we observed the compact settlements, Newari Craftsmanship and artistic carvings of Shree Shes Narayan and the famous Harisidhhi temples. The first attraction of the program was an art exhibition mostly painted by local artists on Nepal and Nepali way of life. And after lunch there was another cultural program that included more local dances called Maitighar, Teej song, Lahana Le Jurayoki etc. Saturday morning was all about fine arts and clay sculptures, and was it fascinating! In the fine arts and clay modelling on the KU premises in the afternoon, the participants were permitted to explore their imagination with colour and brush strokes along with other artists. An idea of bringing many 'artist' in a canvas was experimented with the collaborative painting. Later they were all hung on the walls of KU symbolizing cultural unity. They were clay sculptures symbolizing social evil with a silver dove to depict hope by Kurukshetra University. Krishna Soni from India designed a Mother feeding her baby. The effort of the organizers of KU Dept of Art and Design was commendable. After the opening of the cultural program of the third day by the students of Manipur University with classic English number, there was a dance by National College Baluwatar depicting the life of the Magar community. Then began the mimes starting from a play “Live life, Beware of Aids” by Purbanchal University. Then was a stunning performance by Mumbai University, a folk song 'Banera' that emphasized on the theme “Unity in Diversity”. Among the other noteworthy mimes was the “Patriotism towards Bangladesh from Heart and Soul” by the National University team of Bangladesh that comprised of Dhaka University, Rajshahi University, Jahangir Nagar University, Chittagong University and National University. Captivating the audience with their superb performance the actors paid homage to the Bangladeshi Martyrs who sacrificed their lives for our Language on 21st February 1952. The Fest Dazzled till midnight. And as BRAC once again shook the audience with their amazing Human Puppet show and Folk songs, we discovered how proud we are of our cultural while singing in front of so many different people from all over the subcontinent. Even though the words of Lalon could not reach them his tunes and sheer simplicity was enough to send the meaning cascading down communicate with the audience. During the Cultural performance Salman Raihan Khan of BRAC University addressed the crowd and said, “When my mother called on the first day I arrived here, I told her that I was making friends. But now when I go back home I will say I made Brothers!” everyone instantly related to this feeling as it actually described the kind of event SAUFEST is; providing space for youth to develop friendship among them and ultimately contribute for regional cooperation. The fourth day was a little relaxing for the participants as after the Local Tour and Yoga in the morning, there was the Main Tour to Kathmandu. 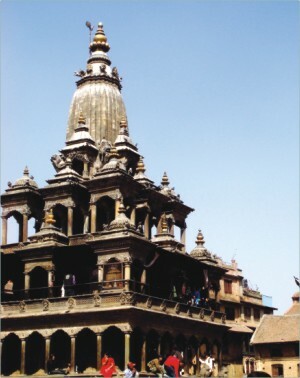 Listed under the world heritage site the Bus took us to Kathmandu Darbar Square and then to Patan Darbar Square filled with a breathtaking range of aesthetic monuments and architectures, antique palaces, shrines and temples offering their age old cultural heritage. After a scrumptious lunch at Baneshwar, some of the participants started for Gurukul for the Drama performance while some headed towards the heart of the Kathmandu city for their long awaited shopping. We discovered how attractive the narrow streets were with hundreds of shops calling out to us with their breathtaking handicrafts, Pashmina, antiquities and so much more. But as we had to get back to the bus in time to go back to KU, we couldn't clench our thirst, longing for some more shoes, some more woodcraft and so much more. Among the most memorable events that happened in SAUFEST2008, the performance of the Local instrumental band Kutumba was noted as the best that night. The band played Nepali folk music with the audience singing along with the melody. 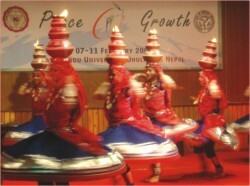 "Resham firi ree", "Saya thari Baja", "Kalilo tamale", "Kanchi re", and "Naachyo Maichyang" left hardly any participants mimicking the Nepali way of Dancing. Their uniqueness lied in their instruments that mainly featured the Bansuri(flute). The day started with a mixed feeling. Maybe because we all started to realize that more than our homesickness, we were overwhelmed by this place and the people here. The Nostalgia swept in as the last day of SAUFEST began. At the Debate, the auditorium resonated in the sounds of objections, agreements, rebuttals and refusals as the debaters from India, Bangladesh, and Nepal exhibited their oratory amidst an applauding and lively audience. "Youth participation alone in the absence of expertise, experience and support of the seniors is not sufficient if we are to make any significant attempt towards regional development" argued Zoheb Ahmed of BRAC University. Marjia Haque from BUET and Tamid Alam from National University also debated on similar topics facing a lot of compelling arguments on the occasion proving our country's potential. Later that day, we went hunting for some local cuisine as the meal that included only vegetarian items was becoming somewhat monotonous. The last of SAUFEST2008 came to a screaming crescendo at the concluding and crest giving ceremony that evening. That was followed by the last supper at the Dhulikhel Resort where the VC of KU Prof. Suresh Raj Sharma hosted the party. And around the small firewood burnings, the delegates and participants rejoiced and danced to celebrate their new friendship without any formality. Some enjoyed the music sitting beside the fire while some took some time off to commemorate the buzz that was on the air that night along with the millions of stars in the clear sky. We came back to KU to find more music and buzz awaiting us in the auditorium where we danced our hearts out with the new friends we made, the new bonds that were being built the new place we will miss and truly wished we did not have to leave the next day. The Nostalgia from the last day turned into tears for some of us on the day of our departure. We recalled our stay here and realised how down to earth the people are from here. From helping us with the toughest task to simply hanging out and having fun, they gave it their hundred percent. And that was the only explanation to the bond that was built within the short span of 7 days. Even if it was hard to make life long friends or brothers for that matter, for some of us there was a string that got attached to this place and all the people we came across here. The Picturesque Dhulikhel the serene environment and the unforgettable hospitality from the University. When is the next SAUFEST being held? "Pakistan is showing interest to host the program next year. But we are still undecided as we are quite flexible in choosing the countries for hosting SAUFEST. Whoever shows willingness will be shortly approached" says Mr. Sampson David, Chief Coordinator of SAUFEST.